LĀNA‘I CITY, HI, November 15, 2016 – The ultimate in must-play golf experiences, the Manele Course at Four Seasons Resort Lānaȉ has been listed among the Top 20 resort courses in the United States for 2017 by Golfweek magazine. The breathtaking Jack Nicklaus Signature golf design is ranked No. 18, a remarkable jump up the list from last year, when it was No. 36. Manele also is one of only two Hawaii courses in the Top 20 of Golfweek’s annual ranking of the 200 “Best Resort Courses.” Kapalua’s Plantation Course on Maui is No. 13. 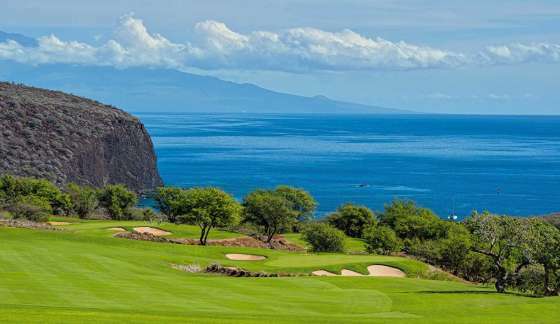 One of the elite venues in the game – yet still very much untouched and uncrowded – the breathtaking Manele layout is built on lava outcroppings and features three holes along rugged oceanside cliffs. The course offers heavenly views of the Pacific on all 18 holes. Its signature hole is No. 12, a par 3 where the tee sits 150 feet above the crashing surf. Five sets of tees ensure a fair, fun challenge for every golfer, but do-or-die shots over natural gorges and ravines must be precise. Manele joins other world-class golf resort courses in the Golfweek rankings that include Pebble Beach Golf Links (California), Pinehurst No. 2 (North Carolina), and Bandon Dunes (Oregon). Located on a pristine island, Four Seasons Resorts Lāna‘i reflects a simpler pace of life and the spirit of old Hawai‘i, offering unique cultural adventures, a myriad of air, water and land activities that complement its world-class golf. The Four Seasons Resort Lanai features 213 guestrooms, lobbies and seating areas for contemplation, multiple dining experiences such as the signature AAA Four Diamond rated ONE FORTY restaurant and NOBU LANAI, the Spa, luxury retail boutiques, tennis complex and a complimentary activity program. A resort with its own island to explore, guests can enjoy upcountry adventures on horse or UTV, fly on helicopter tours, snorkel, sail or scuba dive, explore heritage sites or simply relax on secluded beaches. For more information, or to make a reservation, please contact Four Seasons at 1-800-321-4666, visit fourseasons.com/lanai/or join our online communities at Facebook @FourSeasonsResortsLanai, Twitter @fslanai and instagram @fslanai. (Palm Desert, CA; November 15, 2016) – Beginning November 2016, JW Marriott Desert Springs Resort & Spa offers two new membership deals for those looking for year-round tranquility and access to limitless golf. The Palm Desert resort, recipient of the 2016 Condé Nast Traveler Reader’s Choice: Top Southern California Resorts, allows guests to take advantage of the award-winning facilities with an Epic Golf and Resort Membership ($950 per person annually when purchased by December 31, 2016) and a Spa Wellness Membership (starting at $1,500 per person if purchased by December 31, 2016). Designed by esteemed architect Ted Robinson, Desert Springs’ two 18-hole championship golf courses offer premier conditions for professionals and entry-level players. PGA golf professionals are readily available for professional private and group lessons. Membership is available for $950 per person if purchased by December 31, 2016 ($2,000 after) and includes two complimentary room nights in a Signature View Guest Room. Surrounded by Venetian-inspired waterways and the Santa Rosa Mountains, the Spa at Desert Springs is a serene and scenic destination for wellness experiences. The 38,000 square-foot facility offers 48 treatment rooms, a salon, a saltwater pool, and treatments incorporating ancient healing methods. Membership is $1,700 for six months per person and $3,000 annually per person. An introductory rate of $1,500 is available for six months and $2,500 annually if purchased by December 31, 2016. Additionally, early bookers receive a complimentary Signature View guest room and an InBody body composition analysis, proving a comprehensive view of balance of body fat and lean mass, intracellular, extracellular, and total body water, and a segmental lean analysis. For more information on each of these memberships, guests can contact Esther Fuller at 760.837.1276 or esther.fuller@marriott.com. JW Marriott Desert Springs Resort & Spa, located in the heart of California’s Coachella Valley and framed by three majestic mountain ranges, is a sprawling oasis offering a remarkable contrast to the stark beauty of the desert. The AAA Four-Diamond property is one of the largest resort and convention complexes in the southwestern United States. The resort’s recently refreshed 884 guest rooms and suites are located in wings surrounding swimming pools, lakes, verdant fairways, lush gardens, and manicured lawns. Guest rooms are spacious and include separate tubs and showers, iHome audio systems, and private balconies. Featured dining options include Mikado Japanese Steakhouse, The L Bar, Oasis Bar & Grille, Fisherman’s Landing, Rockwood Grill, and Blue Star Lounge. The resort boasts an award-winning 38,000-square-foot-spa and recreation facilities that include two recently-renovated Ted Robinson championship golf courses, an 18-hole putting course, 20 tennis courts, basketball courts, lawn croquet, badminton, biking, and more. For more information, follow the resort on Facebook and Twitter or visit www.haveitalldesertsprings.com. LA ROMANA, D.R. (November 17, 2016) – The golf program at Casa de Campo Resort & Villas was recently named the Caribbean’s best Golf Resort 2016 at the 3rd annual World Golf Awards. The luxury resort’s three legendary Pete Dye-designed courses, along with professional facilities and luxury amenities, have long been a top priority for guest satisfaction. With 90 holes of awe-inspiring golf for hotel guests, including the legendary Teeth of the Dog and the Links and Dye Fore courses, Casa de Campo offers a mix of play that is challenging for both the highly skilled golfer, as well as the casual weekend player. Created to be a unique test of golf, each course varies and offers a different and unique guest experience: Teeth of the Dog, ranked as one of the world’s best, has long been considered the #1 course in the Caribbean; the 27 holes at Dye Fore play along the cliffs above the Chavón River and around several inland lakes on the Lagos nine; and the recently renovated Links offers tight fairways, small greens, and tall native grasses nestled amongst the luxury villas of the 7,000 acre resort. Although each course is unique, they all play on lush green fairways and have stunning views of the crystal clear waters of the Caribbean Sea. The latest update to the resort’s golf amenities is the new golf facility. The space features 48,000 square feet of teeing room, 13 target areas, and a 400 yard driving range – allowing for more golfers to improve their game at a variety of distances. Located just south of Teeth of the Dog course, the facility includes a dedicated, short-game practice area with pristine bunkers, challenging grass mounds, and unforgiving depressions will be designed to simulate true course play on all three exemplary courses at Casa de Campo. In addition, the putting green has been planted with fresh Paspalum grass, the same type of grass found on the courses – allowing for continued consistency from practice to play. The World Golf Awards is a dynamic awards program designed to recognize, acknowledge, and celebrate excellence in golf tourism. Voting methodology is simple; votes are cast by professionals working within the golf travel and tourism industry – senior executives, travel buyers, tour operators, agents and media – and by the public. Votes are submitted online at World Golf Awards website. The World Golf Awards is the sister to event to the World Travel Awards. For more information on Casa de Campo Resort & Villas and its award-winning golf program, please visit http://www.casadecampo.com.do/golf/. Casa de Campo Resort & Villas – a member of The Leading Hotels of the World – attracts affluent travelers with the offering of spacious hotel rooms, suites and luxury villas. Expect gourmet cuisine and fine wines and spirits throughout the destination’s restaurants and bars, a 370-slip Marina & Yacht Club, Polo & Equestrian Club, La Terraza Tennis Center and 245-acre Shooting Club. Spanning 7,000 tropical acres on the southeastern coast of the Dominican Republic, this luxury Caribbean destination is also home to three of the game’s most difficult courses all designed by Pete Dye, including Teeth of the Dog, Dye Fore and Links. Casa de Campo is also home to Altos de Chavón – an artisan’s village modeled after a 16th century Mediterranean city with boutique shops, museums and a 5,000-seat Grecian-style amphitheater inaugurated by Frank Sinatra in August of 1982. For ease of arrival, La Romana International Airport (LRM) is five minutes from check-in and serviced by JetBlue Airways (now with direct flights from JFK three times a week) and seasonally by American Airlines (non-stop service from MIA). A short drive away, Santo Domingo (SDQ) and Punta Cana (PUJ) operate daily direct flights from all major U.S. airports. For more information, please call 1-800-877-3643, or visit www.casadecampo.com.do. Opened in 1971 and renovated in 2005, Teeth of the Dog is one of four Pete Dye’s designs at the Casa de Campo resort at La Romana on the southeast coast, and was the first Dominican Republic course to use the sea to dramatic effect, putting it on the global golfing map. Its name derives from the jagged rock formations jutting into the Caribbean on which Dye placed tees and greens. Three of its four par-3 holes play over waves to the greens. In total, it has seven holes next to the sea and 11 with ocean views. Dye’s encore, built five years after Teeth of the Dog, was an authentic links-style course hauntingly reminiscent of the British Isles. Recently renovated and planted with Paspalum greens, Dye originally referred to the 6,900-yard Links course as La Barranca or “the little hill.” Situated inland, water comes into play on five holes, while grass roughs and multiple sand traps keep players on their toes. Dye Fore is visually intimidating with seven cliff-side holes that drop a staggering 300 feet to the Chavón River below — challenging players with up to 40 mph gusting winds. Par three holes, #12 and #15, are two of the greatest in the world and the entire course offers 360 degree views of the Caribbean Sea, Dominican mountains (the highest mountains in the Caribbean), Chavón River, Casa de Campo Marina and Altos de Chavón artists’ village. The course was renovated in August 2014 with Paspalum greens. NAPLES, Florida (November 15, 2016) – LaPlaya Beach & Golf Resort – a Noble House Resort located on the idyllic Naples beachfront – is pleased to announce that it has been recognized by the World Golf Awards as “Florida’s Best Golf Hotel 2016” and “North America’s Best Golf Hotel 2016.” Based on a voting system for golf tourism professionals and consumers, the World Golf Awards serves to celebrate and reward excellence in golf tourism, world-class courses, and golf destinations. Presented annually by the World Travel Awards, which is currently celebrating its 23rd anniversary, the World Golf Awards received 1,132,849 total votes this year from 216 countries and territories. Operated on a public voting system, votes are casted by professionals working within the golf travel and tourism industry – senior executives, travel buyers, tour operators, agents and media professionals – in addition to golf tourism enthusiasts. Nestled on the picturesque beachfront in Naples overlooking the Gulf of Mexico, LaPlaya Beach & Golf Resort is the ultimate vacation destination for locals and travelers alike. The resort boasts 189 guest rooms and eight suites; a 4,500 square foot SpaTerre with salon and spa services; a state-of-the-art fitness center with rotating classes; beach butler service; private poolside cabanas with cold towel and sorbet service; BALEEN Restaurant and Tiki Bar; sophisticated meeting and event spaces, and much more. For more information about LaPlaya Beach & Golf Resort, please visit www.laplayaresort.com. Centrally-located in North Naples, Florida, the LaPlaya Golf Club is an 18-hole, par 72 Robert Cupp-designed course that features a natural look and offers challenging yet approachable holes. Fourteen holes feature picturesque water hazards and more than 3,000 stately palm trees grace the course. The Clubhouse boasts an Old World Florida décor that is casually elegant throughout and replete with a wraparound veranda, grill room, golf shop, and full practice facilities. The LaPlaya Golf Club is available for LaPlaya club members, in addition to guests staying at the nearby LaPlaya Beach & Golf Resort. A privately held company for more than 30 years, Noble House Hotels & Resorts, Ltd. was founded in 1979 by owner Patrick R. Colee as a commercial property development group, transitioning in 1994 to a hotel ownership management company. Headquartered in Seattle, Wash., the corporation owns and manages an upscale portfolio of 18 distinct and visually captivating properties spanning the U.S. From luxury resorts in Seattle, Wash. to Jackson Hole, Wyo. and the Florida Keys, each property maximizes and showcases its physical setting. Noble House is continuously growing, operating 45 hotel restaurants, bars and lounges, showcasing local culture and inspiration from local surroundings. With a philosophy that emphasizes “location, distinction and soul,” Noble House Hotels & Resorts exemplifies individuality, dedicating itself to creating and managing exceptional properties that contribute to their communities, staying true to local history, culture and ambiance. www.NobleHouseHotels.com. World Golf Awards serves to celebrate and reward excellence in golf tourism, world class courses, and golf destinations. Golf tourism constitutes a vital segment in the global travel and tourism marketplace. An estimated 60 million golfer visits will take place in 2016 to the 32,000 golf courses and resorts worldwide. The 2016 World Golf Awards will focus on the leading 130 nations who are shaping the future of this dynamic industry. While celebrating and rewarding excellence across golf resorts, courses, and the golfing destinations throughout the world, World Golf Awards strives to ultimately raise the golf tourist customer experience and stimulate both the domestic and international golf tourism market. The voting works on a first-past-the-post system to ensure impartiality and independence. Votes are submitted online via the World Golf Awards website. The winners of each national category go head-to-head with the winners of the other countries before the unveiling of the World Winners. DALLAS, Texas (November 17, 2016) – Three courses and one clubhouse in the Omni Hotels & Resorts Golf Collection are undergoing improvements as part of Omni’s commitment to its premier golf destinations coast to coast, including two of Omni’s most historic properties — the Omni Homestead Resort in Hot Springs, Va. and Omni Bedford Springs in Bedford, Pa.
A new clubhouse will be unveiled at Omni Bedford Springs in summer 2017 which will feature an architectural design that reflects the integrity of the resort, a National Historic Landmark established in 1804. The 5,000-square-foot clubhouse will be home to a restaurant, golf shop, and both indoor and outdoor viewing areas overlooking the Old Course, an American classic designed by Spencer Oldham (1895), A.W. Tillinghast (1912), and Donald Ross (1923). 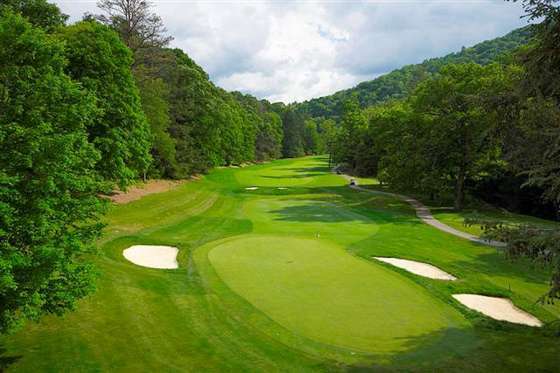 The Omni Homestead is enhancing its Cascades Course, regarded as the finest mountain course in the country, designed by architect William S. Flynn in the 1920s. Most of the work will involve tree removal in key areas to expose the creeks running along several fairways while affecting strategy and shot selection throughout the layout. The project is underway, now that the resort’s golf courses have closed for the winter. The Omni Homestead also is home to the Old Course, completed by Flynn in 1892 and home of the nation’s oldest first tee in continuous use. Both courses are scheduled to reopen on April 7, 2017. The first of two course renovations is finished at Omni Orlando Resort at ChampionsGate, home to two championship Greg Norman-designed courses and the world headquarters of The Leadbetter Golf Academy. The International Course has reopened for the winter season after undergoing a complete restoration of all 18 greens and greenside bunker complexes, returning them to their original sizes, look, and feel. Under the direction of the Greg Norman Golf Course Design group, these were the first enhancements to the coastal-links-style International Course since it debuted 16 years ago. Changes to the turfgrass have produced firmer and faster playing conditions, more consistent greens, better weather tolerance, and exceptional playing conditions for years to come. Next up, the National Course, also at Omni Orlando, is set to undergo a similar restoration project in spring of 2017. The upgrade is part of a multi-faceted, $40 million expansion of the luxury destination. The resort renovation will include building 93 new guest-room complexes ideal for golf groups, buddy trips, and families, and will include new amenities such as a mini-golf course. Located in some of the country’s most beautiful destinations, Omni Hotels’ 12 golf resorts offer a total of 25 courses designed by award-winning architects, some of whom are also legendary champions of the game. Each golf resort is complete with luxurious accommodations and superior service, on and off the course. Omni golf destinations offer challenges for golfers at all levels of play, so pros, amateurs, and their families alike can find courses to enjoy, creating distinct golf vacations in prime locations on legendary fairways and greens. For more information, visit www.omnihotels.com/destinations/golf or call 1-800-The-Omni (1-800-843-6664). NAPLES, FL (November 17, 2016) – The Naples Beach Hotel & Golf Club in Southwest Florida has completed the dramatic renovation—almost reinvention—of its championship golf course. 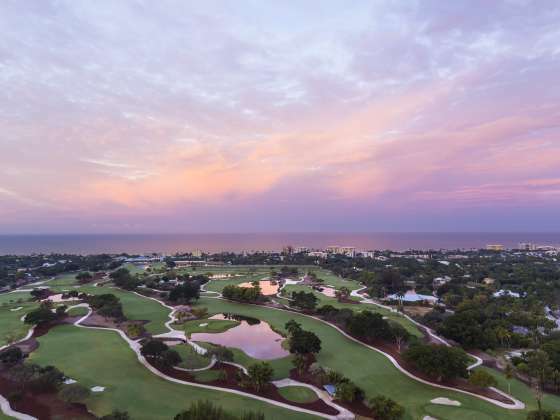 The total redesign of the AAA Four-Diamond beachfront resort’s course was done with input from golf icon and acclaimed course designer Jack Nicklaus in collaboration with noted course architect John Sanford. The Jack Nicklaus redesign of the course began in April, and the course is now open and fully operational, according to the resort’s General Manager Jason Parsons. This major $9 million project follows $50 million in impressive renovations and enhancements at the resort over the last few years. Set on 125 lush acres, complemented by seven miles of pristine white sandy beach, The Naples Beach Hotel & Golf Club is Southwest Florida’s only resort directly on the beach with an on-site championship golf course, a world-class spa, and an award-winning tennis center. Notably, in redesigning the course Jack Nicklaus helped to celebrate his past and that of The Naples Beach Hotel & Golf Club, as he has a unique historical tie to the resort. It was in 1951, on a family vacation to Naples, and a friendly round of golf alongside his father, that the Ohio native accomplished the very impressive feat of first breaking 40 over nine holes on the resort’s course, shooting a 37. At just 11 years old, he came within a shot of shooting par, and just one year after he picked up golf clubs for the first time. This round, in particular, is what drew Nicklaus to the project–the scorecard is even archived in the Jack Nicklaus Museum, the 24,000-square-foot facility on the campus of The Ohio State University. In addition to the new course, the resort has added a 300-yard practice and teaching range, and has new golf carts with GPS tracking systems to aid golfers with yardages on each hole, thus helping pace of play. A great way to experience the resort and the new course is by taking advantage of the resort’s new “Golf by the Gulf” package. Available December 1, 2016-April 30, 2017, the package is available for one golfer, two golfers, or for one golfer & one non-golfer. The package includes: greens fees on the newly redesigned championship golf course, cart rental, bag storage, range balls, and golf gratuities. Note that a two-night minimum is required, and the cart rental is shared for the “two golfers” package. Also, the “one golfer & one non-golfer” package includes a 50-minute massage at the resort’s full-service spa for the non-golfer. Also of great appeal: guests at the resort always benefit from no resort fees, complimentary valet parking and self-parking, and complimentary access to the resort’s fitness center. The “one golfer” package starts at $399 per night. The “two golfers” package starts at $553 per night. The “one golfer & one non-golfer” package starts at $555 per night. Note that the package is based on availability, and blackout dates may apply. The package may not be combined with any other offer, and is not applicable to groups. For more information or for reservations, call (800) 237-7600 or (239) 261-2222 and ask for the “Golf by the Gulf Package.” Or, visit NaplesBeachHotel.com . For golf rates and tee time information, as the course is open to the public, contact the resort’s Golf Pro Shop at (239) 435-2475. Rich in hospitality and tradition, The Naples Beach Hotel & Golf Club has been part of the Naples community since 1946. Owned and operated by the Watkins family for three generations, the resort also features: 1,000 feet of soft white-sand beach; the world-class spa; the fitness center; the Mary C. Watkins Tennis Center with six Har-Tru courts; Beach Kids Club, a complimentary daily recreational program for children ages 5 to 12; retail shops; beach rentals; 34,000 square feet of meeting space; and a variety of picturesque outdoor venues for receptions and events. In addition, the resort features multiple restaurants and lounges. The selection includes: the signature beachfront restaurant HB’s on the Gulf; Broadwell’s, serving breakfast daily and providing panoramic views of the golf course; and the Seminole Store, which serves deli sandwiches, ice cream, gourmet coffees and desserts. The Sunset Beach Bar & Grill has been recognized as the “Best Place To View A Southwest Florida Sunset,” and was named “Naples’ Best Beach Bar” by Travel Channel. Guest rooms and suites feature cool tropical-colored linens, fabrics and carpeting; flat-panel televisions; patios or balconies (with a view of the Gulf, the golf course or the lush resort interior); coffee makers; and refrigerators. Among the recent enhancements was the November 2015 replacement of the brick balconies in the main Tower Building with beautiful glass balconies to showcase the gorgeous Gulf views. Situated just blocks from Naples’ renowned shopping districts of fashionable 5th Avenue South and historic 3rd Street South, the resort is also within minutes of shopping at Venetian Village, Waterside Shops, Bayfront and Tin City. Guests can further experience the area by taking tours of the Everglades, Naples Zoo at Caribbean Gardens, Corkscrew Swamp, The Botanical Gardens, or the Conservancy Nature Center. Boat and fishing trips can also be arranged at the hotel. Other leisure-time activities can include Naples’ outstanding museums, theatres, and art galleries. Providing a comfortable and friendly atmosphere, the resort is an exceptional tropical getaway. The resort is located at 851 Gulf Shore Blvd. North in Naples, Florida. For reservations or for information about rates, contact the resort’s Reservations Department at (800) 237-7600 or (239) 261-2222, and visit NaplesBeachHotel.com . For golf rates and tee time information, as the course is open to the public, contact the resort’s Golf Pro Shop at (239) 435-2475. Machrihanish Dunes was the first 18-hole golf course in the United Kingdom to earn GEO certification, an honor that it achieved in 2010. The 18-hole links golf course located on the west coast of Scotland was designed by David McLay Kidd and is sited on an environmentally protected Site of Special Scientific Interest. Of the 259 acres upon which the course sits, only seven were modified during the creation of the course—just greens and tees—with no heavy equipment or inorganic materials used. Throughout the course-creation process and in all the years since, Machrihanish Dunes has worked hand-in-glove with Scottish Natural Heritage to ensure that the site’s fragile ecosystem (and in particular its protected species of rare orchids and moths) is managed and nurtured in the most sustainable way possible. Among its many other on- and off-course efforts, the club’s rough-management program to protect the orchids, manual removal of invasive weeds, careful management of ragwort to safeguard the health of moths, and commitment to increasing the percentages of perennial grasses in fine turf areas are just a few examples of the programs that Machrihanish Dunes follows to safeguard its coastal environment—as is the distribution of nesting boxes around the course for the benefit of the visiting wheateater population. In addition, Machrihanish Dunes has demonstrated a strong and ongoing commitment to community. The club focuses at all times on the use of local suppliers and is a key contributor to area environmental and charitable efforts. It believes in holistic sustainability that touches upon every aspect of its place in the Kintyre community, and through its charitable arm, The Kintyre Club, has had a positive impact on dozens of worthy causes and thousands of area residents’ lives. The Village at Machrihanish Dunes, voted “Scotland’s Best Experience” by readers of Bunkered Magazine in 2013, is a world-class seaside resort featuring a U.K. Top-100 links golf course, four-star accommodations, casual and fine dining options, a boutique spa, plus a host of other resort amenities, all located in one of Scotland’s most beautiful regions. The Ugadale Hotel & Cottages in Machrihanish offer 22 rooms and suites plus 8 luxurious two-bedroom cottages which are also offered for sale on a freehold fractional basis. The Royal Hotel, with 23 rooms all overlooking Campbeltown Harbour, is located in downtown Campbeltown, a mere 5 miles away. The resort is ideally suited for golfers, non-golf visitors, golf group visits, family reunions, corporate meetings, events and retreats, weddings and other social functions, and more. The course, the first 18-hole course in the U.K. to earn certification from the Golf Environmental Organization, is consistently ranked as one of the most ecologically-friendly courses in the world. Designed by David McLay-Kidd, it opened in 2009 on a Site of Special Scientific Interest (SSSI), the first course ever to be built on such a site and also the first to be built on the west coast of Scotland in over 100 years. 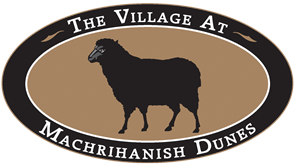 For more information on The Village at Machrihanish Dunes, visit www.machdunes.com. Southworth Development LLC, through its affiliated companies, is the primary owner, developer and manager of Machrihanish Dunes Golf Club and luxury accommodations in both Machrihanish and Campbeltown, Scotland. Grants to the restoration of the Ugadale Hotel in Machrihanish and The Royal Hotel in Campbeltown in cooperation with: Highland and Islands Enterprise (HIE) and the European Regional Development Fund (ERDF) funding support; the Campbeltown Town Centre Regeneration Project (Argyll & Bute Council), a special grant to the Royal Hotel by the Scottish Ministers, through Historic Scotland under the Historic Environment Regeneration Fund. Mallorca, Spain – November 18, 2016 – The International Association of Golf Tour Operators (IAGTO), a global trade association of the golf tourism industry, has named Los Cabos, Mexico as the ‘Latin America & Caribbean Golf Destination of the Year’ for 2017 in recognition of its exceptional golf courses and unique geographical setting. The announcement of this benchmark accolade was made at a gala awards dinner at the International Golf Travel Market (IGTM) held this year in the city of Palma, Mallorca. S ituated at the tip of the Baja Peninsula, at the place where the Sea of Cortes meets the Pacific Ocean, Los Cabos boasts an extraordinary mountain-desert-ocean environment where the game’s top designers have crafted some of the world’s finest courses. Set back from the shoreline’s sun-drenched beaches and sparkling waters are more than a dozen exquisite layouts built by luminaries such as Jack Nicklaus, Tom Fazio, Greg Norman, Robert Trent Jones, Jr. and Tiger Woods. With two courses on GOLF Magazine’s “Top 100 Courses in the World” list and seven of the top 11 courses in Mexico based on Golf Digest’s “Planet Golf” report, Los Cabos is the undisputed golf capital of Latin America. 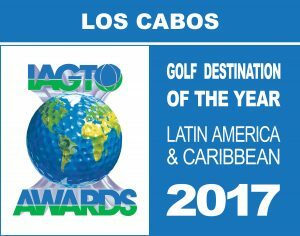 “We are delighted to accept this prestigious award from the world’s leading association of golf travel providers,” said Rodrigo Esponda Cascajares, Managing Director of the Los Cabos Tourism Board. “Dating back to the early 1990s, we have welcomed some of the most spectacular golf facilities in the world. The recent addition of several outstanding newcomers has raised the bar of excellence and taken the Los Cabos golf scene to the next level.” He added that approximately 180,000 rounds of golf played each year in Los Cabos, with visiting golfers generating significant tourism revenues for the destination. Led by several ‘gran turismo’ 5-star hotels and complemented by some of the best sport fishing and off-course adventures in the world, Los Cabos has in the span of 25 years established itself as a hotspot for avid players in search of an unforgettable golf experience. Only in Los Cabos do rolling, verdant fairways circulate players from rugged desert foothills to the turquoise-blue sea. Add 340 days of sunshine and cooling sea breezes, and Los Cabos – or Cabo, as everyone calls it – emerges as a flawless getaway unique to itself. As a family-friendly “lifestyle” destination, with activities ranging from whale-watching cruises to desert jeep tours, Cabo has what everyone wants. Great weather. Superb dining. Sumptuous spas. Dawn-to-dusk nightlife. And the friendliest welcome in Mexico. IAGTO’s tour operators generate more than 85 percent of the world’s golf vacations. Its nearly 600 members, hailing from 61 different countries, selected the 2017 winners. Judges nominated the best golf destinations based on the different experiences of their customers as well as criteria such as customer satisfaction, quality of golf courses and accommodations, price, professional conduct of suppliers, support of the local tourism industry and accessibility of tee times. For more information about Los Cabos, visit www.visitloscabos.travel. VILLAGE OF PINEHURST, N.C. (Nov. 10, 2016) – Pinehurst Resort & Country Club today announced that Hanse Golf Design will redesign Pinehurst No. 4 and develop a short course as part of a master plan to further restore the original character and spirit to the Pinehurst golf experience. Located in the sandhills of North Carolina, Pinehurst Resort & Country Club, established in 1895, is a 2,000-acre property featuring an award-winning spa, nine golf courses, tennis, and activities for the family. Widely known as the cradle of American golf, Pinehurst has hosted more single golf championships than any other site in America, including the U.S. Open, U.S. Women’s Open, PGA Championship, the Ryder Cup, PGA TOUR Championship and many others. In 2024, it will again serve as the site for the U.S. Open. See pinehurst.com or call 855-235-8507 for a complete list of events and activities. MYRTLE BEACH, S.C. — Mystical Golf – offering “Myrtle Beach’s finest 54 holes of golf” on its acclaimed Witch, Man-O-War and Wizard courses – announces two stay-and-play packages perfect to start the 2017 golf season in style. All three Mystical Golf courses are consistently recognized by Golf Channel to be among Myrtle Beach’s “five best courses” and “best values.” The Witch and Man-O-War courses are ranked in the “Top 15 Courses in South Carolina” in Golf Channel’s Golf Advisor rater reviews. From Jan. 1 – May 22, the three-day Gold Package starts at $93 (per person, per day, taxes included). It includes three rounds with cart on each of the much-admired Mystical Golf layouts (plus one complimentary round), three nights’ lodging in well-appointed three-bedroom villa (four beds), free iHOP breakfast daily (available 24 hours per day), and a gratis steak dinner at Logan’s Roadhouse (includes non-alcoholic beverages, taxes). Additional package highlights include two free beers and lunch at the course each day, complimentary daily range balls, instant replay round for cart fee only, and $15 gift card toward a golf shirt. Extra night stays are available at a moderate cost per person. Offered during the same time span, the Silver Package starts at $83 (per person, per day, taxes included) and features all the components of the Gold Package except the complimentary round, daily breakfast and steak dinner. Both stay-and-plays offer one complimentary golfer for booked groups of 20 or more players. Mystical Golf’s three layouts are highlighted by wonderfully fun elements including the only back-to-back island greens in the game (Man-O-War), a front nine of dramatic holes weaving through secluded swampland teeming with wildlife (The Witch), and a splendid layout reminiscent of Scotland and Ireland’s classic courses complete with authentic sod-faced bunkering and castle-style clubhouse (The Wizard). Man-O-War’s 15th hole ranks among GOLF Magazine’s “Five Most Memorable Island Greens” alongside No. 17 at TPC Sawgrass, the “Alcatraz” hole at PGA West’s Stadium Course and Coeur d’Alene Resort’s movable, floating putting surface. The Witch is praised by PGA.com for presenting one of America’s “great ninth holes” and The Wizard has earned 4-1/2 stars from Golf Digest. For Mystical Golf information: www.mysticalgolf.com, 843.282.2977. The Witch course sits on 500 acres of tranquil cypress groves and wetlands teeming with flora and fauna. Tactical play is rewarded on the par-71, 6,702-yard layout. With 4,000 feet of bridges wending through swamps (front nine) and rolling hills (back nine), golfers may spy cranes, bald eagles, alligators and black bears. Man-O-War is revered for its back-to-back island greens and water features touching every hole. With a commanding 141 slope rating, the par-72, 6,967-yard layout is offset by straight-forward shots and excellent, bent-grass greens. Reminiscent of classic, wind-swept links courses in Scotland and Ireland, The Wizard presents deep bunkers, mound-framed fairways and dramatic elevation changes. Trademark stone bridges and an Old-World, castle-style clubhouse add character to the par-72, 6,721-yard shot-maker’s course. The Witch, Man-O-War and The Wizard are in the heart of Myrtle Beach and within 15 minutes of Myrtle Beach International Airport (MYR), beaches, accommodations, restaurants and other attractions. A short distance from I-95 and other major thoroughfares, Mystical Golf courses are easily accessible. More than two dozen cities – including Atlanta, Boston, Chicago, Dallas, New York and Washington – offer direct flights.